The Greeks get a lot of credit for a lot of things, but that doesn’t always mean they deserve it. Take π, that magical number that turns a circle’s diameter into its circumference: It’s designated by a Greek letter and that Archimedes guy estimated it with some polygons, so it must be Greek, right? First of all, the idea of π is way older than Archimedes. The earliest evidence for an understanding that the ratio of circumference and diameter is fixed comes from Babylon and Egypt. Both cultures came up with decent estimates for the value of π between 2000 and 1500 B.C. 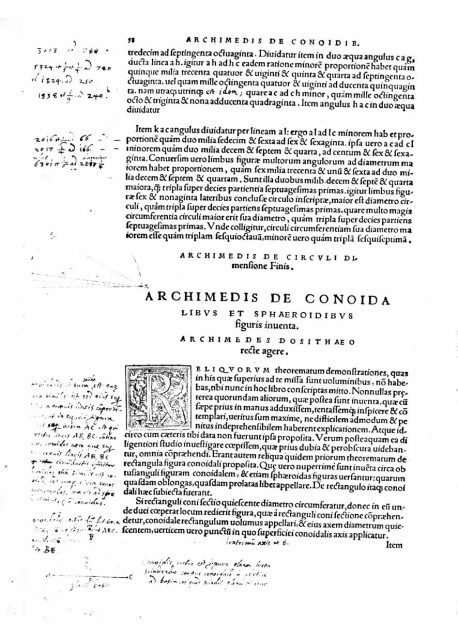 ; Archimedes wrote during the third century B.C. 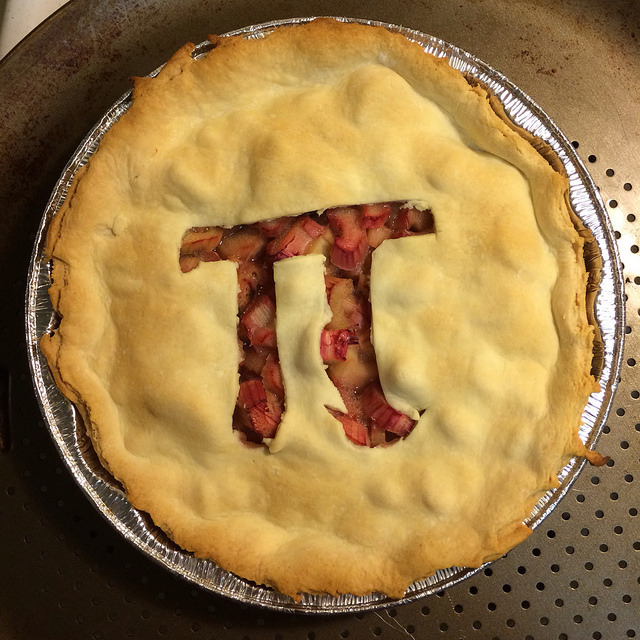 For most of history, π wasn’t really represented by any particular symbol at all. Like Archimedes, many mathematicians just wrote out what they were talking about, using whatever variation of “the ratio of the circumference of a circle to its diameter” they happened to prefer. Otherwise, they just used the current numerical approximation. Three was a popular simplification, but many estimates were actually quite close to the value we know today. And even when mathematicians finally decided it would be handy to have a standard symbol, there were a few other contenders to fill the role of what became π. In 1655, John Wallis used a square or a Hebrew character that looked like a square. (I’d hazard a guess the variation may have been less his initiative and more a reflection of what font the printer happened to have on hand.) It didn’t catch on, maybe because it’s just too difficult to fit a square peg into a round hole. In 1689, Johann Cristoph Sturm chose the letter e and represented the diameter with the letter a, making the circumference ea. 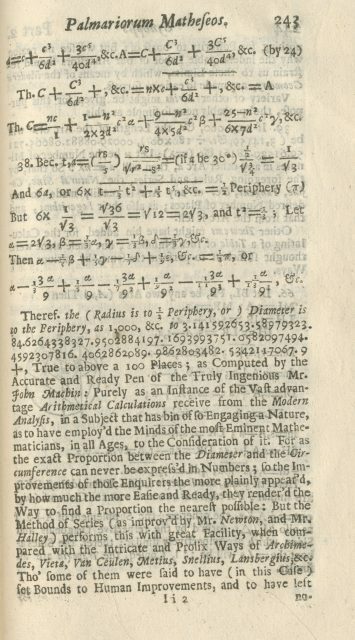 The true birth of π as we know it came in 1706. A Welsh mathematician named William Jones published a book in which he uses π in two different ways. 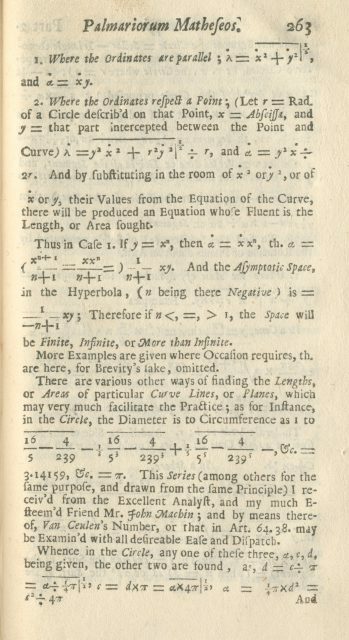 On page 243, he lets π equal the perimeter of a circle while he notes the shiny new calculation to 100 places of π, “the [ratio of] (Radius is to ½ Periphery, or) Diameter is to the Periphery.” This echoes the use of William Oughtred, who used π/δ to represent the relationship between circumference and diameter. But on page 263, Jones has his stroke of genius and sets π equal to the ratio. An early 19th century historian who compiled more than 800 pages on the history of mathematical notations wrote of Jones’s innovation: “He took this step without ostentation.” And it remained without ostentation until a rather more famous mathematician adopted the practice, Leonhard Euler. But even once π was the undisputed symbol for the ratio between a circle’s circumference and diameter, there was still the tricky matter of actually remembering the number it represented. One popular approach was to compose mnemonic devices, often structured so that the number of letters in each word matched each digit of π, a strategy called pilish. There are dozens of examples in languages from Albanian to Swedish. Now π is second nature to us, but next time you find yourself impatient with calculations, spare a thought for the mathematicians who spent millennia doing math with words instead of symbols and raise your glass to π!